The FPM-5750 Battery Operated Flow Indicator and Totalizer is compatible with the following flow sensors: FP-5300, FP-5100, FP-5200 and FP-6000 flow sensors (see related links below). The large digital display indicates flow rate and totalized flow volume simultaneously. One of the three totalizers is resettable from the front panel or a remote location, while the second resettable totalizer can only be reset by entering a user-selectable security code. Meanwhile, the third is a permanent non-resettable totalizer. Our intuitive software design and four button keypad provide for simple operation while setting screen displays and programming the system. Calibration can be easily performed by entering the Auto-Cal feature and entering a value to match an external reference. Screen displays can be modified to suit the user’s needs; along with the flow rate, any of the three totalizers can be selected as the displayed totalizer. 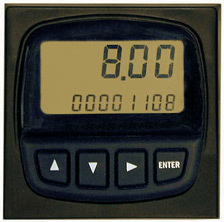 Users can quickly scroll through the totalizers simply by pressing any key on the keypad. A display averaging feature is included for applications where the flow in the pipe fluctuates. For applications where flow stops and starts due to production needs, a no-flow indicator will display the hours of non-flow. This product is very similar to the FP90 Series transmitter and requires flow sensors and fittings to be purchased separately. 참고: Comes complete with TWO "AA" 3.6V Lithium batteries and operator’s manual.